This article is part of our Holiday Reads 2013 series. I love books about India and whenever I go there on holiday, I take a list of all the books I’ve heard about during the year that I might be able to find more easily in India. 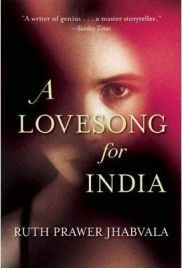 Ruth Prawer Jhabvala’s A Lovesong for India was one of my purchases in 2011. Whilst I generally prefer Indian writers, I also enjoy Ruth Prawer Jhabvala’s semi-outsider view of Indian life. Although she was born German to Polish parents, she moved to England and then married an Indian – architect CSH Jhabvala – and together they spent many years living in India. She now splits her days between New York, London and Delhi and A Lovesong for India reflects that complexity in her own life. The book is actually called A Lovesong for India – Tales from East and West and I was a little disappointed not to get more stories set in India. I enjoyed the others but I would have liked more Indian stories. A Lovesong for India contains eleven short stories, none of which are linked to one another. The first four are set in India, the next four are all on a theme the author calls ‘Mostly Arts and Entertainment’ and the final three are ‘The Last Decades’. There are no ‘duds’ amongst these eleven offerings but some are more memorable than others. The Indian stories kick off with ‘Innocence’, a story in which the narrator is a young European woman living as a paying guest in the home of an Indian couple who have fallen on hard times. We gradually learn about the shame that brought down the landlord and landlady and how it has impacted on their lives and left them feeling unworthy. Next is the story that gives the book its title – ‘A Lovesong for India’. This is a beautiful tale of a couple – he Indian, she English – and their enduring love which keeps them safe and together when their son makes serious mistakes that might have broken the family apart. ‘Bombay (pre-Mumbai)’ is the story of a beautiful girl who almost accidentally marries the son of a very wealthy and famous Bollywood actor. This is a story of a family falling apart as the daughter-in-law starts to take the role of hostess for her father-in-law. It’s an eerie but fascinating tale. The final story set in India is called ‘School of Oriental Studies’ and examines two women, one a rather mousy professor from an American university called Maria and the other, Anuradha, a larger than life Indian poetess. Maria wants to translate Anuradha’s poems but gets lured into Anuradha’s family politics when the poetess drags her into a complex plot to send her son away to America to avoid an unsuitable attachment to the wrong sort of girl and subsequently changes her mind. Mostly Arts and Entertainment is a section of stories set in the USA. ‘Talent’ is the story of Magda, the artists’ agent and Ellie, the manipulative ‘talent’. When Magda introduces Ellie to her cousin Robert, she has no idea that Ellie will play the two of them off against each other and will become obsessed with Robert. ‘Critic’ tells of a film critic called Theodore who writes a cutting review of a film starring an actress called Patty Pope who then tries to influence him into writing a script for her. We’re left wondering what she’s REALLY after and whether it’s all a complex revenge plot. ‘The New Messiah’ is the story of Rita and Kris (short for Krishna), an Indian brother and sister living in London. When Rita’s employer Nathan becomes obsessed with her brother and wants him to star in his big blockbuster film, Rita knows that no good can come of it. ‘Pagans’ tells of two sisters, Brigitte and Frances, and Brigitte’s young Indian protégé Shoki who wants to write screenplays. Unbeknownst to Frances, there are plenty of reasons why her husband Marshall disapproves of Brigitte’s relationship with Shoki. The stories in the section called ‘The Last Decades’ are about death and aging. ‘Death of an English Hero’ is a wistful story about a man who is found dead in an out of the way Indian border town leading his mother to discover that her son – who we presume to have been some sort of spy – had both an American wife and an Indian mistress of whom she knew nothing. ‘The Teacher’ is about and Indian ‘guru’ called Dr Chacko who is adopted by a group of New Yorkers who believe he can show them the way to enlightenment. He moves into the narrator’s cottage in her garden and a friendship develops despite her lack of interest in or understanding of his philosophy. The final short story ‘At the End of the Century’ was my favourite of them all. It tells of two half sisters, Celia and Lily and of Lily’s marriage to a beautiful young man called Gavin. It’s an extraordinary and deeply unconventional love story with plenty of twists and turns and was the story with lingered longest in my mind. It hints at much without explicitly stating the facts. Lily gets pregnant by a homeless African man she meets under a bridge and the family together set out to bring him up. RPJ writes beautifully about interactions between people of different classes and castes, about manners and morality and it doesn’t matter whether her protagonists are Indian, English, American or from the moon because the themes remain very similar. She writes about people tortured by politeness and trying to ‘do the right thing’, about those unable to address the elephants in the room, edging delicately around them to avoid conflict. If Jane Austen had been born in the 20th Century, she’d have found her match in Prawer Jhabvala and her drawing-room discussions of the right way to behave. There is timelessness about many of the stories and it’s hard to place many of them in space and time whilst others are quite precisely placed. In one story a young man dies of a horrible disease and all the signposts of AIDS are there for those who want to spot them but can be easily missed by others. She covers a range of social classes from the down at heel landlords of ‘Innocence’ to the Bollywood glamour of ‘Bombay (before Mumbai)’. Her characters are often sweet, frequently gullible and too often surrounded by people who are devious and manipulative. Each of the eleven stories leaves its mark on the reader but there are few parallels to be drawn between the events of the different tales. Whilst I liked each story individually and enjoyed those set in the west as much as the eastern ones, I remain unconvinced that they knit together as a whole. There are no clear themes to tie them all together and I couldn’t help feeling that RPJ had perhaps had a bunch of short stories knocking around and decided to shove them all together to make a book. They are each exquisitely observed little slices of lives but when put together they don’t entirely gel. I always think a good book of short stories should be like a box of expensive chocolates, each delicious in their own right but somehow adding up to more than the sum of their parts. However in this case, each is indeed delicious but the flavours don’t go together well. It’s less like a box of chocolates and more like a box containing dainty chocolates and beautifully presented sushi all put into the same wrapper. No Comments on "A Lovesong for India"